On a chopping board, peel and finely chop the onions, garlic and carrots, then trim and finely chop the celery. Pick and finely chop the rosemary leaves, then finely slice the bacon or pancetta. Put a large saucepan on a medium-high heat and add 1 tablespoon olive oil. Add the bacon, rosemary, garlic and veg, then cook with the lid ajar for 10 to 15 minutes, or until softened and just turning golden, stirring occasionally. Stir in the mince, turn the heat up to high and cook for 5 to 10 minutes, or until browned all over,stirring and breaking it up with a spoon as you go. Add the tomatoes, tomato purée, vinegar and bay leaves. Crumble in the stock cube and pour in 400ml boiling water. Stir well, turn the heat up to high and bring to the boil. Season with pepper, reduce to a low heat, then cover and simmer for around 1 hour, stirring occasionally. Re-fill and boil the kettle. Carefully fill a large pot three quarters of the way up with boiling water, add a tiny pinch of salt and bring back to the boil. 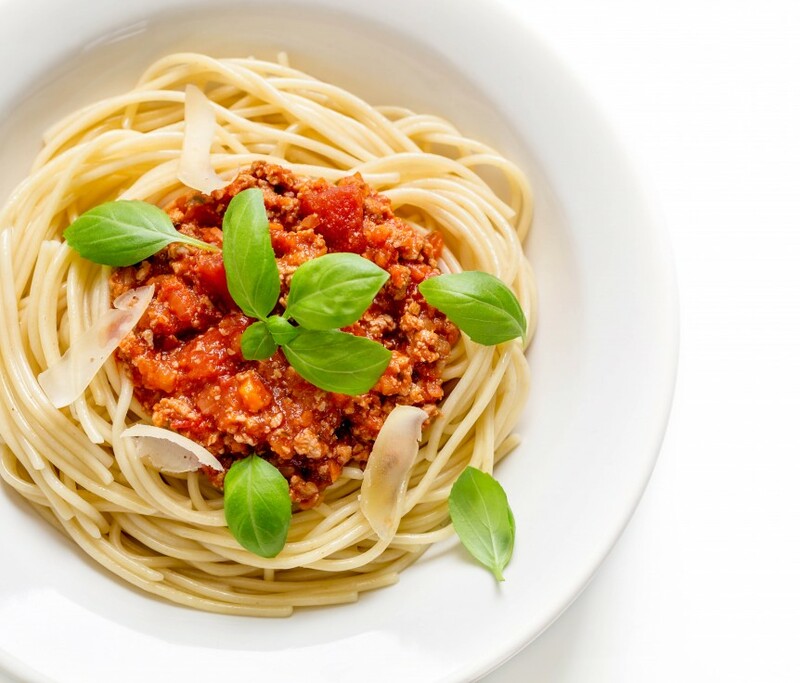 Add the spaghetti and cook according to packet instructions – you want to cook your pasta until it is al dente. This translates as ‘to the tooth’ and means that it should be soft enough to eat, but still have a bit of a bite and firmness to it. Use the timings on the packet instructions as a guide, but try some just before the time is up to make sure it’s perfectly cooked. Using a microplane, finely grate the Parmesan cheese onto a clean chopping board (if using). Carefully pick out and discard the bay leaves. Put half the sauce into a container, leave to cool, then freeze for another day. Divide between bowls and sprinkle with Parmesan cheese (if using), then serve.